Tolkien and C.S. Lewis: The Gift of a Friendship by Colin Duriez. Discussion begins August 20th. Burning Sky by Lori Benton. 2014 Christy Award Winner for Historical, First Novel, and Book of the Year. A Broken Kind of Beautiful by Katie Ganshert. Note: I loved this book. Here’s a link to my review. Safe by the Marshal’s Side makes a great start for the Witness Protection continuity series from Harlequin’s Love Inspired Suspense. As a fan of Inspirational Romantic Suspense, I’m hooked, and ready to read through the rest of the series. Happily, the sixth and final book has recently been released, so I can go snag them all for my eReader without delay. For a year, U.S. marshal Hunter Davis has protected witness Annie Delacorte and her toddler daughter. But now, someone is determined to stop Annie from testifying against the men who killed her husband. To guard Annie, by-the-book Hunter will have to break a promise to himself: to not get emotionally involved. After all, he already cares more deeply than he ever imagined for the sweet family of two… a family he’ll do anything to keep safe and sound by his side. The blend of romance with suspense makes for a fun and lively read. As the story begins, someone has discovered the location of the safe house where Annie and her daughter have been hiding under the protection of Hunter’s team of U.S. marshals. When an intruder makes an intimidating and clearly threatening delivery, Hunter whisks them off to a new location. But that’s not the end of the danger. Far from it. With the trial date approaching, and uncertainty building over how the location could have been leaked, and how to prevent further security breaches, the tension is pretty high throughout. Plus there’s the growing attraction between Annie and Hunter as she comes to realize there’s more to him than the strictly business persona he’s shown her for the past year. I found both hero and heroine to be very likeable people with believable goals and motivations. And Annie’s daughter Sophia was simply too cute for words. It was fun to watch them face significant challenges together and draw closer in the process. The action on both the suspense and romance fronts heats up at the end of the book, and I enjoyed the vivid way certain scenes were described to draw out the reader’s emotional responses. The ending certainly worked for me. There’s a surprise twist introduced at the end and a few details are left unresolved, setting things up for future books in the series. I’m definitely looking forward to finding out where the Witness Protection continuity series will go from here. To learn more about author Shirlee McCoy and find out how to connect with her on social media, check out her Web site. And for those who read and enjoy this title as much as I did and want to find the rest of the series, here’s a list of the titles and their respective authors. A treat for fans of historical romance and of Christian women’s fiction, Blowing on Dandelions makes a great start for Miralee Ferrell’s Love Blossoms in Oregon series. I’m getting a late start on reading the Love Blossoms in Oregon series, having only just now finished reading the first book, a year after its publication. But with Book 2 (Wishing on Buttercups ) released this past February, a complementary novella (Forget Me Not ) released in March, and Book 3 (Dreaming on Daisies ) coming in October, this seemed as good a time as any to start reading the series. I’m glad that I did because Blowing on Dandelions made for a very enjoyable read, and I look forward to the chance to learn more about some familiar characters in other books in this series. The author does a great job balancing the need to stay true to the time period (1880s Oregon) with telling a tale that appeals to present day readers. We get interesting historical details in a way that doesn’t take us out of the story. In fact, the story feels almost timeless, perhaps because of its focus on relationships and the emotions, both good and bad, accompanying them. Besides fulfilling the expectations of a good romance (lots of obstacles, both internal and external, on the way to a satisfying happily ever after ending) this book also delves deeply into relationships beyond that between the hero and heroine. And it does so from LOTS of different viewpoints, for a multi-faceted look at those relationships. Viewpoint characters include not just Katherine Galloway (heroine) and Micah Jacobs (hero), but also the heroine’s mother, daughter, and some of the boarding house guests. While using more than a few viewpoints can risk putting distance between a reader and a story, I think in this case it adds depth to the story, sheds light on some significant misunderstandings between characters, and allows some of the less sympathetic characters to be viewed with more understanding. Relationships dealt with in this book include those between a mother and daughter (Katherine and her domineering mother, as well as Katherine and her young daughters), between friends (relationships within Katherine’s quilting group, as well as between her mother and another strong-willed woman determined to befriend her), and … oh yeah … between a man and a woman who are each dealing with the deaths of their respective spouses and falling in love again. It’s a complex tapestry of relationships, this author weaves, and she does a beautiful job of it. With her experience as an accredited counselor and minister to women it’s no wonder she’s able to show both helpful and challenging relationships in such a believable and realistic light. As I read and got to know the characters and their relationships better, I was drawn more and more into the story, and was pleased by the changes that took place as time went on. Recommended reading for fans of historical romance and women’s fiction, but particularly for anyone who might be dealing with difficult family relationships, because this book takes a very hopeful look at just that kind of relationship. Thank you to the publisher, David C Cook, for providing me with an electronic copy through NetGalley for review purposes. Opinions expressed are my own. Readers can learn more about author Miralee Ferrell on her Web site, and can connect with her on Facebook and Twitter. 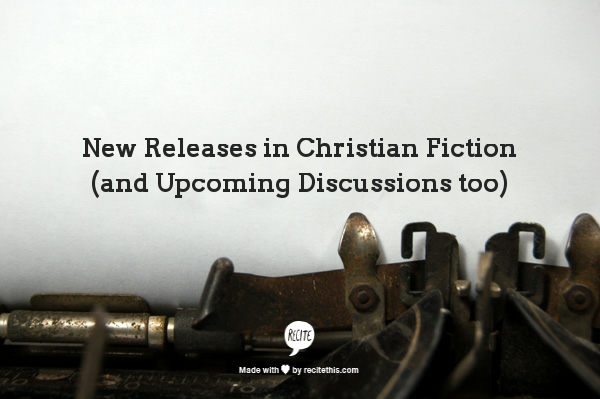 There are lots of new releases in Christian Fiction this month, across a variety of sub-genres. I’ve assembled a list organized by sub-genre below. Something for everyone! Are you interested in participating in an online book discussion this month? At the bottom of the page I’ve listed some discussions set to take place in the near future. Check out the books to choose from. Maybe you’ll see one you’d be interested in reading and discussing. The ACFW Book Club lists All My Belongings by Cynthia Ruchti as their next title for discussion. This group’s discussion takes place by email, so you’ll want to join the mailing list early so as not to miss out on announcements or discussion. The Books and Beverages blog is hosting a monthly Inklings discussion series on titles by and about C.S. Lewis and J.R.R Tolkein. This month’s book is Till We Have Faces by C.S. Lewis and the discussion is scheduled for July 16. The Christian Fiction Book Club hosted by Melissa Norris and Amanda Dykes will be having a “Summer Free Read” for the Month of July. Join them on Facebook to discuss a title of your choice. The Fans of Christian Romance group on GoodReads will be discussing Chances Are by Traci Hunter Abramson throughout July. Know of any other online Christian fiction discussions open to new participants? Please share in the comments! Or maybe you saw a title or two in these lists you’re looking forward to reading. Which ones caught your attention? Eyes Wide Open is a real page turner with cliff-hangers and plot twists around every corner. The story kept me guessing from beginning to end, and I enjoyed every minute of it. My name is Christy Snow. I’m seventeen and I’m about to die. I’m buried in a coffin under tons of concrete. No one knows where I am. My heart sounds like a monster with clobber feet, running straight toward me. I’m lying on my back, soaked with sweat from the hair on my head to the soles of my feet. My hands and feet won’t stop shaking. Some will say that I’m not really here. Some will say I’m delusional. Some will say that I don t even exist. But who are they? I’m the one buried in a grave. My name is Christy Snow. I’m seventeen. I’m about to die. In a return to the kind of storytelling that made Black, Showdown and Three unforgettable, Ted Dekker drags that question into the light with this modern day parable about how we see ourselves. Humming with intensity and blindsided twists, Eyes Wide Open is raw adrenaline from the first page to the last — pure escapism packed with inescapable truth. Not all is as it seems. Or is it? Strap yourself in for the ride of your life. Literally. Let me start by saying that the cover of the paperback edition is way cooler in person than it appears on your screen. You know those holograms that you turn side to side and the picture changes depending on the angle you’re viewing it from? Well the glasses on the cover of this book have reflective bits that show a rainbow of colors as you change the angle you view them from, much like you might see from actual broken glass. I thought that was a nice touch. Yes, I read the actual paperback. Despite the fact that I most frequently read fiction on my Kindle, and despite the innovative episodic way this book was released in electronic format, I read this one the old-fashioned way. Why? Because I won an autographed copy through a Goodreads contest. I cannot tell you how surprised or how pleased I was to win it. But, since a picture is worth a thousand words, here’s a selfie of me holding my plunder. Wait. Can you call it a selfie if you use a tripod and the camera’s self-timer function? Hmmm… I’ll go with yes for now, but that’s really neither here nor there, is it? Sadly the hologram effect doesn’t show up in this picture either. Oh well. You’ll just have to take my word on that for now. A little background on this book before I go into more detail on what I liked about it. 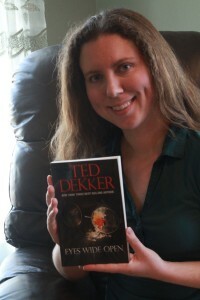 This title is the first in the Outlaw Chronicles by Ted Dekker, which, at this point, also includes Water Walker and Hacker. Sources say you can read them in any order, though they do share a common character who is introduced in an earlier book called Outlaw. It’s worth noting that Outlaw recently won the Christy Award in the Suspense category. I have not previously read any of these other titles, but I have to say, having finished this one, I’m tempted to track down copies of the others as well. Eyes Wide Open consists of four parts – Book 1: Identity, Book 2: Mirrors, Book 3: Unseen, and Book 4: Seer. These parts were originally released (in ebook form) episodically over a period of weeks, and the full collection is now available as a single title in electronic, paper, and audio editions. Book One is also still available as a free download. Be warned. It’s designed to hook you into buying the rest… and it’s effective. This book explores the concept of identity through the experiences of two likeable teen-aged characters placed in a situation where neither they, nor the reader, can be sure just how much of what is happening is real and how much isn’t. Dekker does a great job keeping the level of suspense high and allowing the uncertainty to grow throughout the book, until finally revealing the unexpected ending. The allegorical approach this story takes got me thinking about familiar concepts and ideas in new ways, which turned out to be a lot of fun. Yes, this is Christian fiction, but you might not see it until near the end. Take one part Twilight Zone for the bizarre situation the characters find themselves in, one part Chronicles of Narnia for the Christian allegory, and add a big helping of suspense of the cliff-hanger and unexpected-plot-twist variety, and you’ve got a general idea what to expect. I did not want to put this book down, and when I did, I couldn’t stop thinking about it. Highly recommended.